Chinese Lunar New Year falls on February 5 this year, and the entire celebration lasts for a total of 15 days. It is a Lunar New Year tradition to eat certain foods and snacks to bring prosperity and blessings for the upcoming year. For this reason, restaurants and businesses prepare special Lunar New Year dishes just for the occasion. While there are varying New Year’s traditions depending on the region and ethnic group, most people believe in eating noodles for longevity, rice cakes for success, or fish to bless the upcoming year with a surplus of food and money. Because 2019 is the Year of the Pig, restaurants like Uniboil in Los Angeles are making unique dishes specifically centered around pigs. The Sichuan pork trotters at Uniboil are served whole and individually wrapped with gold leaf sheets. Since 24-karat gold is very soft and fragile, each trotter must be meticulously wrapped. The 24-karat plated gold makes for the ultimate “wow” factor. Edible gold is all about opulence. Uniboil’s pork trotters are already extremely flavorful with their spicy numbing sauce, while the gold does not have any flavor and only adds sparkle to the dish. With the intent to usher in prosperity for the new year, these pork trotters wrapped in gold are a fitting symbol. To wash down the spicy pork trotters, Uniboil is also unveiling two new limited-edition drinks for the Lunar New Year. 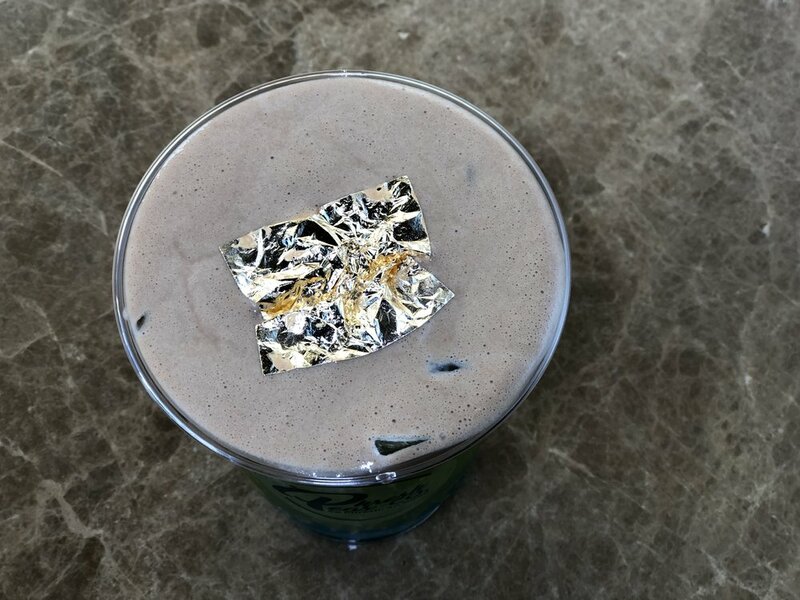 The first is a tri-layered concoction topped with 24-karat gold. The drink is made with blue agar jelly, jasmine green tea and tiramisu cream topping. For those who are not familiar with agar jelly, it is considered a healthier alternative to boba. It has a similar taste and is also chewy, but made with algae fiber. Agar is said to help digestion and help detoxify the body.